Mount Moriah is the northern most 4,000 footer that the Appalachian Trail goes over before heading into Maine. The summit is tiny but is open and offers excellent 360 degree fantastic views of the Presidential Range and the Mahoosuc Notch in Maine. The most direct route to the summit is hiking up the Carter-Moriah Trail. Longer approaches can be taken from the Stony Brook Trail or the Rattle River Trail. Carter-Moriah Trail: 4.5 miles, elevation gain of 3,400 feet. The Carter-Moriah trailhead is at the end of Bangor Street off of Route 2 just past the center of Gorham. The trail has mostly moderate grades with decent footing with a few steep ledge sections. 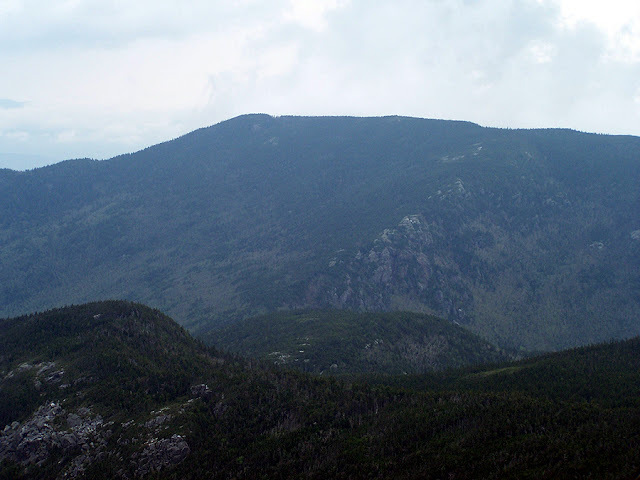 While most of the hike is in the woods there are decent views of the Presidential Range from the ledge sections around the minor summit of Mount Surprise. Stony Brook and Carter-Moriah Trail: 4.75 miles, elevation gain of 3,250 feet. The Stony Brook Trail is located on NH 16 a couple of miles before reaching the center of Gorham. The trail has great footing and easy grades over the first two miles. The footing becomes a little rougher and steeper as it gains the ridge but it's still relatively tame compared to White Mountain standards. Once gaining the ridge the summit can be reached by heading left (north) on the Carter-Moriah Trail for just over a mile. There are some nice open ledges with terrific views on the way up to the summit. In my opinion it's a much nicer approach than heading up the Carter-Moriah Trail from Bangor Street.